He wasn’t the greatest player to hit the ice, though he certainly served his purpose and showed his hard work and dedication. It’s the off the ice stuff-all the people he touched, from the little kids to senior citizens – that’s the thing most people remember about him. Many fans remember the fights and the flowing red hair, but many more remember Keith Magnuson as one of the greatest ambassadors the Chicago Blackhawks franchise has ever had. 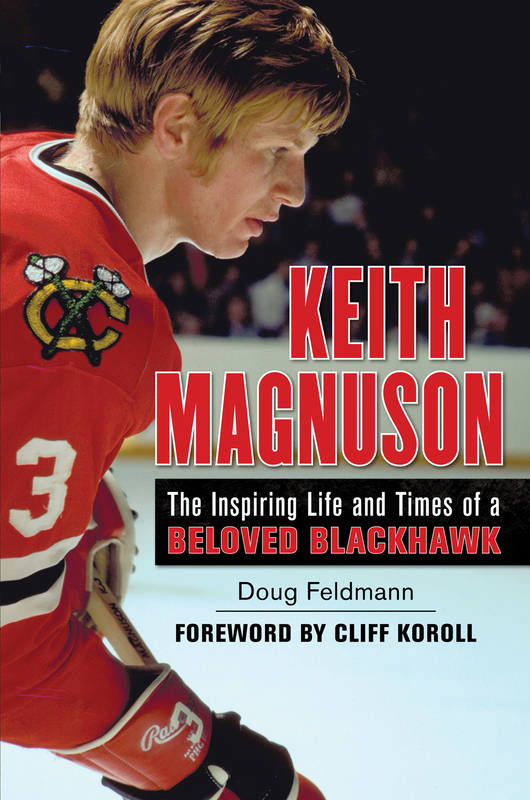 In his new book, “Keith Magnuson: The Inspiring Life and Times of a Beloved Blackhawk,” Doug Feldmann provides a fabulous remembrance of a man who was committed to the Indian head sweater. It has already been ten years since an automobile accident took the life of Magnuson, a fantastic leader on the ice and an even better one off it. Feldman penned this great book with the full permission of Magnuson’s family, and does a masterful job of capturing the man and the player. Many memories of “Maggie” on the ice are similar to this story from the book describing a duel between the Hawks defenseman and Philadelphia’s Dave Schultz. By now, Magnuson was as seasoned as anyone in the league at all forms of physical tactics, and was not about to let anyone intimidate him, even in the hostile Philly environment. Before a faceoff in the Chicago zone, he and Schultz circled around each other with angry glares, as if they were a couple of stray dogs with a piece of meat sitting between them. Magnuson then took the initiative, readying himself with his patented “shoulder shrug” in loosening his arms before battle, and sprung upon Schultz, striking him with several right hands before the Flyer returned multiple strong blows himself. Magnuson and Koroll were teammates at the University of Denver, still a prominent hockey program that plays its home games walking distance from where the Hawks will take on the Avs this evening. Maggie captained DU (yes, the University of Denver is DU) to its second straight NCAA championship in the spring of 1969 and joined Blackhawks that fall. He quickly established himself as a much-needed enforcer on a team with Bobby Hull and Stan Mikita up front. Today, the Keith Magnuson Memorial Award is given to the best defenseman on the DU men’s hockey team each year. Magnuson was instrumental in the founding of the Chicago Blackhawks Alumni Association, which awards a Keith Magnuson Scholarship each year. He was tireless in representing the Indian head in the community. Bob Verdi remembered Maggie earlier in November. I was a hug Keith Magnuson fan. I never knew about this book. Where can I get it?